My wife bought me a copy of this novel – signed by the author! – while I was briefly in the hospital (nothing very serious) and I wanted something to read. Hospitals are a great place to read: one is always waiting for the next procedure to take place; one can make oneself comfortable; and it is not particularly noisy! She bought it because I had asked for a novel by a Man Booker shortlist author. 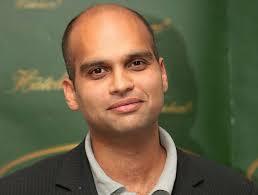 The author, Aravind Adiga, actually won the Man Booker in 2008 for his first novel, The White Tiger. Adiga was born in Madras (new Chennai) India in 1974; after achieving his secondary school certificate, he emigrated with his family to Australia, where he graduated from high school in Sydney. He graduated, next, from Columbia University in 1997 and subsequently studied English literature at Magdelan College, Oxford. He began his business career as a financial journalist with the Financial Times, Money and Time before becoming freelance. Selection Day is a book focused on Indian cricket and its effect on a Mumbai slum family of two boys and their compulsive father. Radha, the older brother, expects to fulfill his father’s dream of being selected for a top Indian team. Tommy Sir, a coach/agent/promoter introduces the boys father, Mohan, to a ‘businessman’, Anand Mehta, who pays Mohan a stipend in return for a large slice of the boy’s earnings when they become famous. Unexpectedly, Manju, the younger boy, is the better batsman, scoring 497 not out in a crucial contest. Radha has a ‘weight transfer problem’ which is inhibiting his effectiveness as a batsman. Enter a rival, Javed, a cocky, rebellious, rich kid who is also a fine batsman, and who happens to be gay. Manju, at the center of the story, is his older brother’s best friend and rival, and his father’s severest but respectful critic. The younger batsman is torn between his admiration for Javed, and his reluctance to commit to an intimate relationship; and between careers in cricketing or in science. Selection Day offers a rich mixture of conflicted, imperfect characters with whom the reader cannot help but empathize. The setting of Mumbai is drawn with natural clarity; one feels truly present. And without being a ‘book about cricket’, Selection Day, presents the culture, the mystique, the competitiveness of Indian youth critic captivatingly, without technical fussiness. The dialogue is credible, but occasionally seems too tangential to lead the reader to any firm conclusions. Perhaps, this is Mr Adiga’s intention with this novel: to make the point that, try as one might, there can never be the achievement of one’s ultimate dream. This sense of failure seems to carry over into the two concluding parts of the novel: what happens after selection day and in the epilogue. One cannot help but be engaged by the beautiful writing, the energy, and the unfolding future in the lead up to selection day. The writing is as good, but the energy and the future have dissipated after selection day. Perhaps this novel could feel more whole, more consistent, if dreams could be scaled back rather than dispelled, and the energy and the future modestly re-directed.